Maps illustrating the robust negative correlation between witchcraft beliefs and trust. 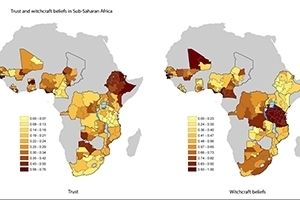 Belief in witchcraft is widespread across sub‐Saharan Africa. In some countries, more than half of the population believes that certain people can cast curses or spells that cause bad things to happen to other people. But how do these widespread beliefs affect sub-Saharan society? For the first time, a large-scale economics study tackles this subject, definitively linking the belief in witchcraft with the erosion of social capital. In the study published last spring in the Journal of Development Economics, American University Assistant Professor of Economics Boris Gershman found a strong correlation between the prevalence of witchcraft beliefs and the erosion of social capital, the network of beneficial relationships that are necessary for a productive society. The metrics of social capital include interpersonal trust, religious participation, and charitable giving. Gershman’s study draws on data from a Pew Forum on Religion and Public Life survey of 25,000 people in 19 sub-Saharan countries. In places where witchcraft beliefs are widespread, Gershman found that people are less likely to trust each other. The study showed that people exhibited diminished trust in their fellow community members, relatives, and local institutions. The prevalence of witchcraft also corresponded with a decline in charitable giving and participation in religious group activities. Earlier research examining the economic implications of social capital, says Gershman, reveals that low social capital can hurt trade and business transactions, which in turn adversely affects a region’s economic growth. From a policy perspective, Gershman’s results stress that witchcraft beliefs as an element of local culture is something that international aid groups need to consider when undertaking development projects in these regions, especially those that require communal effort and cooperation. Without a strong foundation of trust and cooperation, it's difficult to complete projects that would be beneficial to the economy. Gershman sees a possible solution for these regions: education. He believes that modern education may reduce the prevalence of witchcraft beliefs boosting trust and economic progress. “Education may contribute to an environment with higher levels of trust and mutual assistance, insofar as it helps to promote a rational worldview and reduce the attribution of any misfortune in life to the supernatural evil forces of other people in the community,” he says.